Delivering an unrivaled combination of design, luxury, technology and performance, the 2017 Jaguar XF continues to be a top choice for the midsize luxury sedan segment. 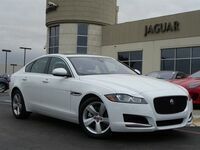 Boasting Jaguar's aluminum-intensive architecture and robust engine choices, the new XF delivers incredible performance. And with the XF's blend of contemporary luxury materials and finishes, traditional Jaguar craftsmanship and state-of-the art technology, you can enjoy the supreme VIP treatment. Take a look at this 2017 Jaguar XF vs 2016 BMW 528i comparison to see how the new XF favorably stacks up against the competition. The Jaguar brand is synonymous with exceptional performance, and with the 2017 XF, every excursion is filled with driving excitement. It offers three advanced engines — the efficient 180-hp 2.0 L 4-cylinder turbocharged diesel, 340-hp 3.0 L supercharged V6 and 380-hp 3.0 L supercharged V6. In comparison, the BMW 528i only offers one engine — a 240 hp 2.0 L 4-cylinder. A major factor in the XF's high-level performance is the advanced aluminum intensive architecture developed by Jaguar Cars that provides an impeccable ride, handling and dynamics. This new architecture facilitates a near perfect balance, supporting an agile and precise drive. Also, the XF offers the available Adaptive Dynamics, which instinctively modifies the vehicle’s response to conditions and your driving style. With all of the Jaguar XF's cutting-edge technology, it's easy to be well-connected and entertained on your trips. Enjoy the latest in-car infotainment and stay connected to your XF and the world with the Jaguar InControl suite of advanced technologies. They integrate seamlessly with your personal devices, data and media — helping to improve and enrich your ownership and driving experience. Focus on the road with an advanced Head-Up Display system using laser technology. This optional state-of-the art system projects a range of important information onto the windshield, where its crisp, bright image can display vehicle speed, navigation, cruise control notifications and Traffic Sign Recognition data, remaining clear even in direct sunlight. 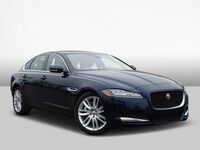 Another advantage of the Jaguar XF is its cheaper price tag, with a base MSRP of $47,450, which is $2,750 lower than the BMW 528i ($50,200). Despite the lower price, the XF still comes with the high-level luxury, sophistication and refinement that Jaguar enthusiasts have come to expect with the English brand. Inside the cabin, the driver and passengers can enjoy a range of contemporary materials that are exquisitely crafted to offer exceptional comfort and style, complemented by the choice of either carbon fiber or wood veneer finishes. Additional ambient illumination throughout the XF cabin can be ordered to enhance its elegant interior, and with many personalization options, such as the optional illuminated treadplate, you can create an XF to suit your style. If you live in San Antonio, Boerne, Schertz, New Braunfels or anywhere else in Bexar County or South Central Texas and would like to get behind the wheel of the 2017 Jaguar XJ, then don't hesitate to contact us at Barrett Jaguar!